Karlie Kloss, Ellie Goulding and their celebrity clique have given us some serious wanderlust after their recent trip together to Jordan. The supermodel and singer were joined by royals Princess Beatrice and Prince Hussein of Jordan, as well as designer Misha NoNoo for a star-studded holiday in the Middle Eastern destination. The celebrities took to Instagram to post pictures of their breath-taking holiday in the dramatic landscape of Jordan's Wadi Rum Desert. Named the Valley of the Moon for its pink terrain, sandstone cliffs and carved canyons, the scenery has often been used as a set for films like Star Wars. From hiking to dune bashing and enjoying a celebrity camp out, the group of A-listers have inspired us to explore what Jordan has to offer. 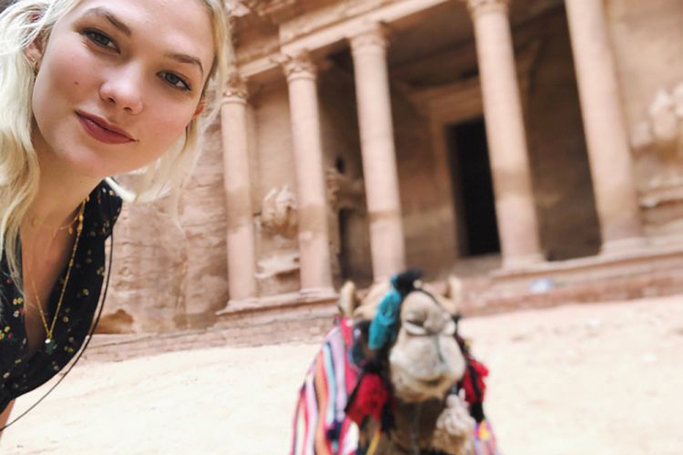 As Karlie Kloss posed with the backdrop of the ancient site of Petra (remember Indiana Jones) and even took a camel selfie, we definitely need to put Jordan on our bucket-list of places to visit.